Tendor, an activist and a musician, who first started advocating word separation in written Tibetan a year ago, has been writing with word separation at his bilingual blog www.yarlungraging.com. Although “aerated” Tibetan script may look startling at first, this minor change has the capacity to turn the chore of reading into a pleasure. I believe that a study by the Tibetan Department of Education or a similar institution should formally assess the merits of word separation. A top-down implementation of an aerated writing system in the Tibetan schools, starting with the elementary classes and moving up to the higher grades, can bring about the immediate revival and long-term survival of the Tibetan language. Imagine if ten years from now, Tibetan students can read Tibetan with the same ease with which they can speak it, and children crave and nag for Tibetan language comic books! Such a future is certainly possible if we adopt word separation today, making the same leap that almost all other literate cultures have already made. If this top-down implementation sounds too radical at this time, it might be more realistic to urge a bottom-up initiative that can gradually spread among the Tibetan public. To this end, I ask bloggers and writers in and outside Tibet to experiment with aerated script, to add space between words. Written Tibetan can remain hallowed and privileged, or it can be accessible and popular. Since the time of Emperor Songtsen Gampo, it has been written Tibetan, bod-yig, that has bound the three provinces together, bod-yig that has preserved the intrinsic unity of the Tibetan people through imperial fragmentation and governmental dissolution. Bod-yig, Sambhota’s legacy to all Tibetans, has saved us time and again. Now it’s time for us to save this legacy. Future generations will thank us for allowing our words to breathe and to live. When Thonmi Sambhota, the outstanding innovator of the Tibetan script, single-handedly devised the Tibetan writing system in the 7th century (and among other innovations introduced the dot between syllables), there were considerations which no longer hold true now: at that time, parchment or paper was scarce and expensive. Printing was done laboriously from woodblocks and dense continuous script fit more words onto the woodblock and more content on the page. These considerations are irrelevant today thanks to advanced printing technology. Let’s not forget that in the early days the script was not meant for mass consumption but rather seen as an elite privilege that one needed years of laborious training to master. After all, most writing systems in the world were developed not for mass consumption, but for the administration of empire and for governance. In fact for the greater part of the written word’s six thousand-year history, the different writing systems have required the presence of scribes who trained for long years to be proficient in reading and writing them. In Tibet, of course, the spread and diffusion of Buddhism has meant that the Tibetan writing system became the ultimate tool to preserve and transmit the teachings through the culture of the great monasteries. Within the monastic curriculum itself, years could be devoted to instill reading and writing proficiency in the young student. Today, with the public school system – with the medium of study often Chinese or English – taking precedence over the monastic model, we no longer have the luxury of a long training period. And the Tibetan writing system is already complicated enough without the handicap of a script that may look beautiful but might well suffocate itself. The variations in spelling are mostly unpronounced, and words are often said differently from the way they are written. If space between words can be as an inhaler to the asthmatic, and revive Tibetan literacy for future generations, what might be the costs of whitespace? A legitimate concern is that the unparalleled canon of Tibetan literature will be inaccessible to future readers accustomed to reading separated words. However, a few hours’ practice should allow scholars who will be fluent readers to access old manuscripts. Word separation will be crucial not only to beginning readers parsing lines, it will be an aid for scholars engaged in reference reading by facilitating swift silent reading and an expanded field of vision. As an interesting aside, it will also simplify the creation of a computer spell-check program and translation program for Tibetan. I know this proposition will upset and outrage many Tibetans, because we have always been resistant to change – and we have been writing this way for centuries. But remember that traditionally scripture was written in stanzas so that readers always knew where to pause even without space. Most writers writing in Tibetan today do so in prose. The young reader slogs through, stumbling ever so often. Even the learned scholar trips every once in a while. All things being equal, where words are spaced and comprehension is easier, more people will pick up a book. My brother Tendor and I have been informally testing the merits of word separation on a number of Tibetans, making them read two copies of the exact same text, one containing continuous script and the other containing separated script. Without exception, every one of the surveyed Tibetans found it easier to read and comprehend the separated script. We hope to continue the survey online and make it available to all interested participants. In fact, this is what people throughout the world have been doing with other writing systems. 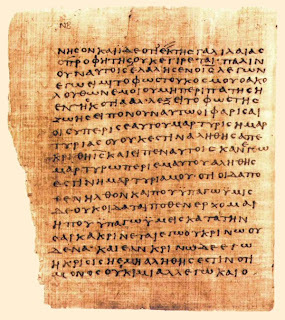 Ancient Greek and Latin were written in scriptura continua, which is continuous script without spaces between words. Paul Saenger, the distinguished scholar of medieval writing practices, asserts that it was only at the end of the seventh century that Irish monks began to introduce spaces between words into medieval manuscripts, and it took several centuries for this practice to be adopted as standard. (Paul Saenger argues that it was this “aerated” script that led to the development of silent reading as we know it.) This space between words, also called whitespace, is now ubiquitous across many writing systems. Even Hindi, previously written in continuous Devanagari script (the base from which Thonmi Sambhota devised the Tibetan alphabet and writing system) is now spaced. Korea’s Hangul, previously continuous, is now generally spaced. Ethiopic, which like Tibetan uses the interpunct, the dot – although they double it, like so (:)- is increasingly written with a space between words. There was a poetry reading at the Rubin Museum of Art today. Tsering Wangmo Dhompa read from Rules of the House, In the Absent Everyday and from her new book which is not out yet. I had the books and had read the poems, so hearing her read was like hearing a sweet old song that I haven’t heard in a while. I feel like her poetry is more diasporic than exilic – which is perhaps another way of saying that it is more cultural than political- but it is so moving. It feels familiar and yet remarkable: she touches on familiar themes, ideas, and images but by remarking on them with her clear far-seeing eyes and gorgeous voices, she makes them remarkable. This is from Bardo, a poem to a dead uncle or as she calls him, “Uncle who is no more.” “You are dead, go into life, we pray.” How beautiful, how non-sentimental and fitting. It is hard to pick a favorite but I particularly love this one. A stranger’s town can make you shy. Dogs barked at our heels. Avuncular and in their own way, marking every entry. Here is someone else’s place of origin. Dust in the morning – eager-eyed grit. Amber grass. People spilled on to the streets like red ants driven out of hiding. The language is startling. The images are old images made completely new. The verbs she chooses, the way she sees and expresses ideas, makes all the difference in the first lines. “The town smeared itself around nightfall.” How surprising, and yet how true. This is what a town in a fog looks like at night, a smear against, around the dark. A lesser poet might have said “House lights looked like stars” or “House lights imitated stars”- Dhompa says, “House lights attempted star life.” When she says, “Here is someone else’s place of origin,” there is so much story there- both the speaker’s and that actual someone else’s. The only line I don’t like is the next one; I find the image of people spilling out like red ants jarring, incongruous, but the rest of the poem with its detached wisdom and small surprises (like “eager-eyed grit”) is perfect.